Giving Back Is Important to Us. Here’s Why. Giving back is important to the team here at West 7th Smiles. We know everyone needs excellent dental care, and that our duty to provide high quality dentistry extends beyond just our patients who can afford to pay for it. Every year, we take part in two charity events for the benefit of our community: Save a Smile, an initiative for children’s dental health led by Cook Children’s hospital, and Give Back a Smile, for victims of domestic and sexual abuse. Keep reading to learn more about these events and how we’re bettering our community by providing high quality dental care for all patients! Every year, too many kids in our country go without the dental care that they need to develop strong, healthy smiles. 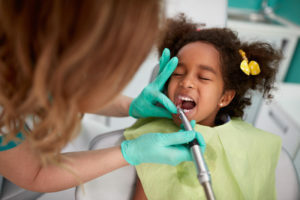 Whether it’s due to finances or a lack of awareness surrounding the importance of dentistry, this gap in care has a serious effect on kids’ overall health and happiness. They may have to live with painful toothaches that eventually require extraction. They may be reluctant to smile because they don’t want to show their teeth. They may miss more school days due to tooth pain. In the most tragic cases, children may suffer death due to an infected tooth that spreads to the brain. We know we can do better for kids in Fort Worth — and that’s why the team at West 7th Smiles is committed to taking part in two charity events each year. Through Cook Children’s Hospital’s Save a Smile event, our team provides dental screenings for children once a year. The care is provided right here in the West 7th Smiles office, so we can make use of our state-of-the-art technology and comforts to ensure all kiddos get the high quality care they need. Our work with Give Back a Smile also serves another group that often desperately needs dental care: men and women who have been victims of domestic and/or sexual abuse. Through Give Back a Smile, a charitable foundation founded by the American Academy of Cosmetic Dentistry, we can give renewed hope and beautiful smiles to people who have suffered trauma to their smiles by a former spouse, partner, family member, or due to sexual assault. We are truly humbled by our experiences helping with Save a Smile and Give Back a Smile. To learn more about these opportunities or how you can get involved, please don’t hesitate to get in touch. Dr. John G. Boyd cares deeply for his community and values his role as a trusted provider of general dentistry for patients of all ages in and around Fort Worth. To learn more about West 7th Smiles’ community involvement or to schedule an appointment for you or a loved one, you are invited to contact the office at 817-882-8282. Comments Off on Giving Back Is Important to Us. Here’s Why.